Yard Dreams takes art out of the white box and into the streets—and yards—of Belmont. I will be one of fifteen 15 artists installing art in neighbors’ yards this for the weekend. The art will be on view 5 p.m. Friday to 5 p.m. Sunday, with a self-guided tour all weekend and a fun neighborhood potluck block party to celebrate the end of Summer on Saturday evening (3-9). My piece, mending, tweaks two of my neighbors via perhaps the best-known poem in the American canon, Robert Frost’s Mending Wall. The two—both my friends—have a long list of grievances and have found that the best solution is not engage with one another at all. Sometimes that is the best idea, and it probably is in this case and a palisade fence now separates them. 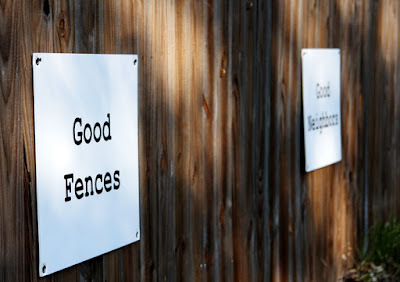 Although the best-known phrase in the poem is “Good fences make good neighbors,” Frost clearly thinks otherwise and backs his claim by pointing out that Nature never allows a fence to stand for very long. My piece, presented with the good-spirited cooperation of one of the neighbors in question, allows visitors to rearrange the words of that line to propose alternative approaches.